Not taking care of your dog's ears? That's earresponsible... 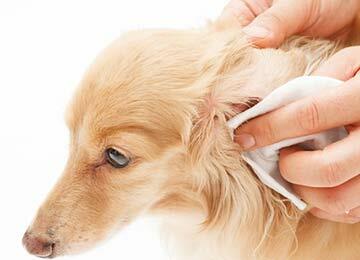 Improve your dog's ear health. Read below for more info on how to help. Ear infections, mites, foreign debris, and wax buildup can range from uncomfortable to just plain miserable for your pup. Here’s an easy how-to guide to restore ear health and make your furry friend a happy camper again. 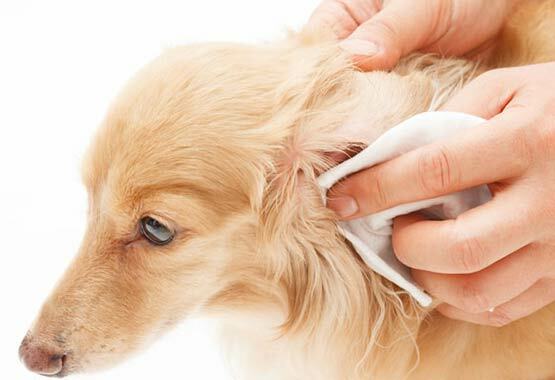 It is extremely important to maintain clean ears for your cat or dog. 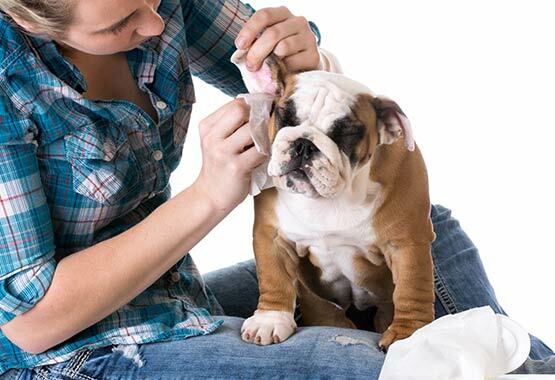 Even pets who aren’t prone to ear infections need clean ears! Ears can be a breeding ground for bacteria. 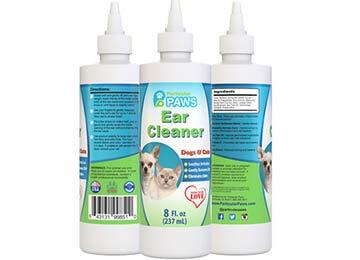 Just a few drops of Particular Paws dog and cat ear cleaner and a cotton ball will ensure your pet’s ears remain free from inflammation, debris, excessive wax buildup, aches, odor, and rashes. Step 1. Lift your pet’s ear so that the ear canal is exposed. Step 2. Place the nozzle into the ear opening. Step 3. Squeeze in 5-10 drops of Particular Paws ear cleaner into the canal. Step 4. 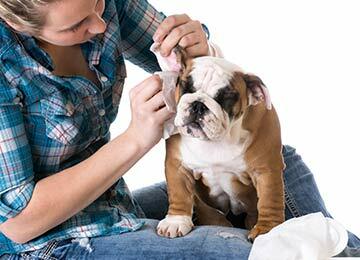 Lower the outer ear and gently massage your pet’s ear, from the outside so that the cleaner can disperse. Step 5. Moisten a cotton ball with ear cleaner and lift the outer ear again. Step 6. Place the cotton ball into the ear canal and swab out any debris inside of the ear. If you’re treating an ear infection, use this cleaner daily! For prevention and general cleaning, use about once per week. The great thing about Particular Paws ear cleaner is that it is made from 100% all-natural ingredients making it perfect for all breeds of cats and dogs throughout their life stages. Containing Aloe vera, Bosweallia serrata gum extract, tea tree oil, vitamin E and oak extract, it is gentle enough even for sensitive ears. 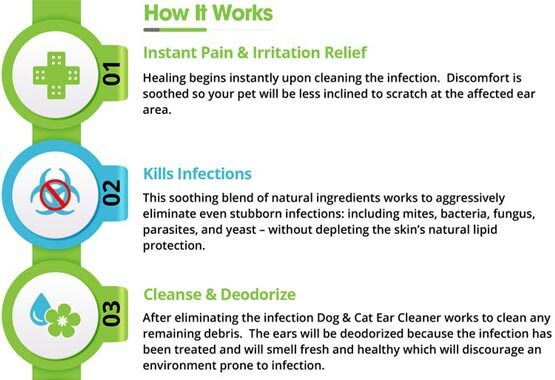 Ear infections can make life miserable, and our cleaner can make your dog a happy camper again. Just a few drops effectively fights infections, reduces inflammation and heals ear aches, rashes, itchiness and general discomfort. Also keeps ears clean and healthy by removing dirt and other irritating particles. 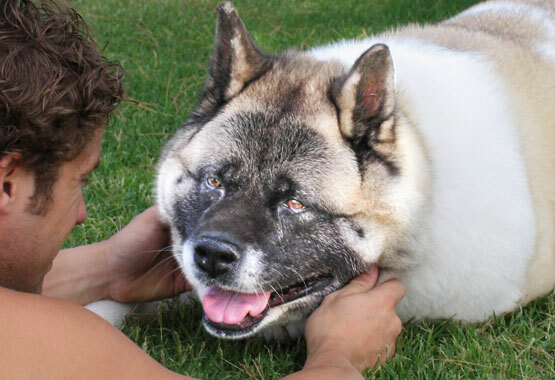 Excessive ear scratching by your dog can lead to permanent damage and even hearing loss. Particular Paws Ear Cleaner doesn’t just treat the issue, it also provides cooling itch relief. Regular use promotes cell repair and itch relief.healthy ears! 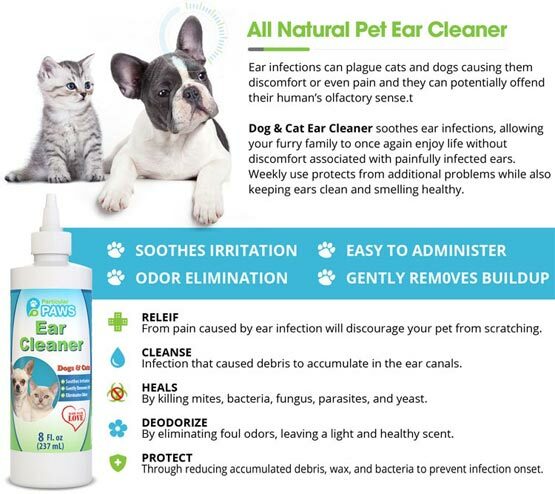 Cleans both the ear canal and the outer ear skin of the ear so your dog won’t feel the need to scratch excessively, which can cause permanent damage and even hearing loss. ➡Aloe Vera Helps reduce itchiness, redness and other discomfort. ➡Bosweallia Berrata Gum Extract Herbal extract helps reduce inflammation. ➡Tea Tree Oil Natural anti-fungal and antiseptic which helps prevent ear mite infections. ➡Vitamin E Promotes cell repair and healthy skin. The formula is powerful but also gentle enough for sensitive ears. 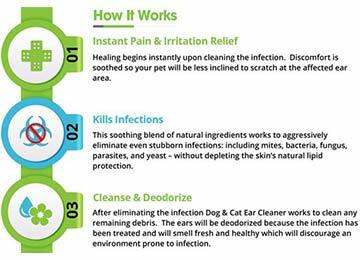 The all-natural ear cleaner contains no harsh chemicals or toxins. Safe for all breeds and ages of dogs. HELP PROTECT YOUR DOG'S EARS NOW! 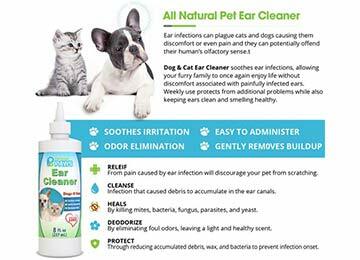 All-natural formula that gently, yet effectively neutralizes ear yeast and bacterial infections, even ear mite infestations! Keeping yourpets ears clean and free from debris can prevent a serious ear condition down the road. Not only will you be preventing ear infections and parasites, but also cauliflower ear, ruptured ear drums, in some cases, even deafness! Just a few drops effectively kills microorganisms, removes debris consumed by ear mites, and reduces swelling, pruritus, as well as, inflammation that results in a ruptured ear drum. ➡ YES! Send Me My Ear Cleaner! Not a fan? No problem! Made in the USA in a GMP-compliant facility for the best quality. If you’re not satisfied for any reason, contact us for a hassle-free refund. Our #1 priority is to make sure you and your furry friend are completely happy! We have no doubt this product will satisfy you and your pet's ears. It relieves pain, cleans infections, heals their ears, eliminates foul odors, and protects them from future infections. What's not to love? Buy from us Today. I had to say goodbye to my best friend, a beautiful 120 pound Akita, Cleopatra who was only 13 when arthritis stole her from me. An old injury I thought she had recovered from developed into a painful, life-limiting condition that ruined her quality of life. After Cleo passed away, I kept wondering if there was more I could have done to keep her strong and healthy longer. Was there something I could have done? The guilt and questions just ate at me. Then it hit me -- as a lifelong fitness buff, I knew how taking the right supplements made all the difference in the world in my own health. What if there were something that could have made a difference for Cleopatra, not only in how long she lived but in her quality of life? What if the right supplements could have kept her by my side for years longer, and given her more happy and pain free years? 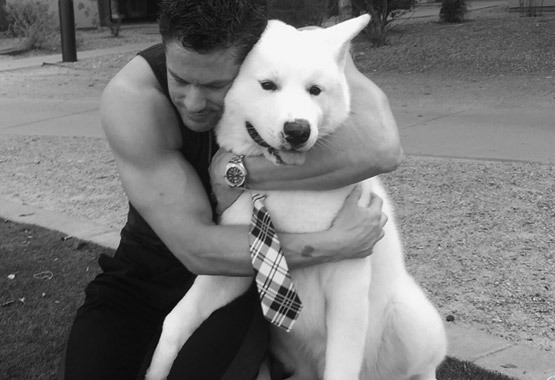 My new doggy, Theodore inspires me to follow my dream of honoring Cleo by producing over 20 additional, natural, holistic products and supplements to help upgrade the quality of life and well-being for all our furry loved ones. I am convinced Cleopatra passed away too young and our dogs should live 15 years or more! That’s why I believe in providing for our pets the way we provide for ourselves and I have made it my mission to create products to help pets live longer and enhance their quality of life. Watching Cleo suffer from arthritis was the most painful experience in my life, it almost felt like it was happening to me. The first product I created was the Particular Paws Advanced Joint and Hip Supplement. 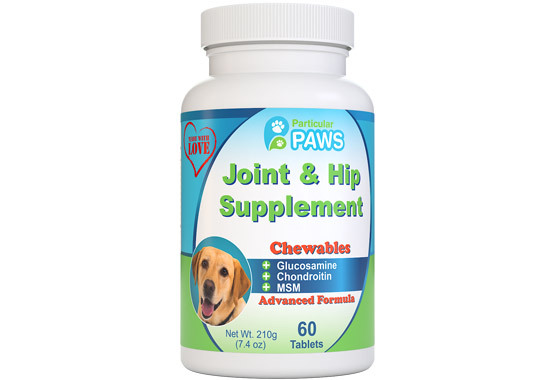 This chewable, drug-free, natural formula contains Glucosamine, MSM, Chondroitin, Hyaluronic Acid, Omega 3 & Omega 6 has a taste and smell dogs love! But most important, it helps ease the pain from arthritis and joint issues and is safe to give to young dogs as a preventative measure. I am also passionate about helping rescue dogs and the health struggles they go through, so I created The Particular Paws Dog Rescue Kit – containing our 10 best selling products and partnered with rescue groups around the country to help distribute them. When a shelter dogs are adopted, they go home with Rescue Kits to help ease the transition into their new home. I wish I had created Particular Paws when Cleo was just a puppy. She would have lived a much longer, healthier life. You don't have to go through what I did. Start your pets on Particular Paws products today and give your pets the quality of life they deserve! My new doggy, Theodore inspires me to follow my dream of honoring Cleopatra by producing over 20 additional, natural, holistic products and supplements to help upgrade the quality of life and well-being for all our furry loved ones.